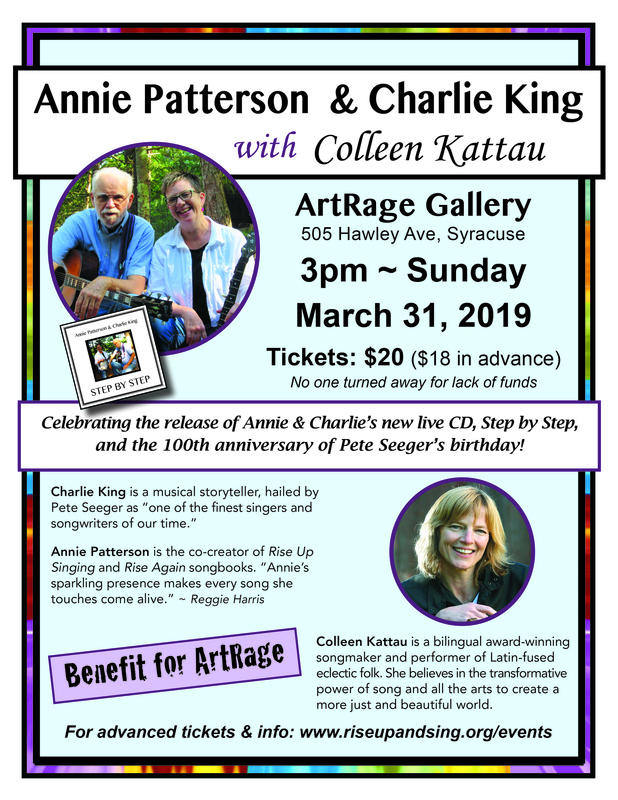 Celebrating the release of Annie & Charlie’s new live CD, Step by Step, and the 100th anniversary of Pete Seeger’s birthday! Join us for an evening of powerful singing with two of North America’s finest activist folk singers. Charlie King and Annie Patterson are touring together in the Midwest in March 2019. Charlie’s witty political satire and his uncanny ability to find endearing songs about struggle and the human experience are a natural fit with Annie’s own performing and sing-along work. Charlie and Annie have often recorded & performed together, including Annie’s vocals on Charlie’s 2017 CD “Life & Love, Tears & Laughter“. They are releasing a new live album “Step by Step” early in 2019 and are taking these songs on the road. Charlie is a beloved nationally known activist, satirist, and musical story teller Pete Seeger hailed him as “One of the finest singers and songwriters of our time.” He sings and writes passionately about the extraordinary lives of ordinary people and has been at the heart of American folk music for over half a century. He is the 2017 Phil Ochs Award, in recognition of his music and activism for social and political justice in the spirit of Phil Ochs. Annie is the co-creator of Rise Up Singing and the 2015 sequel Rise Again. She is an accomplished performer of traditional Appalachian & Celtic music as well as singer songwriter material that touches on a wide range of issues facing our world today. She has performed and led music retreats at folk festivals, coffee houses, schools and camps throughout North America, New Zealand, the Netherlands and the British Isles, accompanying herself on banjo, guitar & mandolin. Charlie and Annie are infectious song leaders whose energy and humor empowers us and keeps us moving forward. Joining Charlie and Annie will be Colleen Kattau who is a bilingual award-winning songmaker and performer of Latin-fused eclectic folk. She believes in the transformative power of song and all the arts to create a more just and beautiful world.